For most homeowners, you either have the good fortune to have ducts and an HVAC system in your house or you rely on other heating/cooling means such as radiators, window air conditioners, etc. 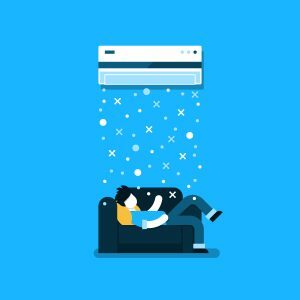 Wouldn’t it be nice if you could retrofit your home with a centralized heating and cooling system, without having to blow your budget or worry about whether your house is too old? Ductless mini split systems actually exist, and they can be used to provide heating/cooling to old and new homes alike that were built without functional ductwork. Ductless systems generally consist of an indoor, wall-mounted unit and an exterior compressor. The interior units are connected by tubing that delivers refrigerant, so only a small hole needs to be drilled into the wall. This means ductless systems greatly reduce the likelihood of air leakage, and they’re actually incredibly energy efficient, because in an average house, nearly 25% or more of your energy is lost to ductwork. With a ductless system, you can achieve precision cooling and heating regardless of where the indoor units are installed. How? Each unit can be controlled separately, so every room can be adjusted to provide customizable comfort levels. The systems also run fairly quietly and that means no loud noises keeping you up all night. One of the biggest advantages to the ductless system is how easily it can be integrated into any home, regardless of the space available or intended configuration. The flexibility afforded by these mini split heating/cooling systems is part of what makes them so wonderful—they can be adopted or adapted to accommodate changes in your life, including new additions to your home. Imagine wanting to build an addition of some kind but realizing that your duct work will have to be extended, or that the obvious solution to heating or cooling the room just isn’t there. With a ductless system, it becomes a simple matter of adding another unit and an additional supply line. Plan to smoke in one of the rooms, but afraid the smoke-filled air will travel to other parts of the house via the ducts? You won’t have that issue with a ductless setup. If you’re adding air conditioning to a house with no existing ductwork, trying to correct a specific room’s heating/cooling needs, or are thinking of downsizing, ductless systems are perfect additions. Air quality is another aspect of your home life that could be improved by installing a ductless system. Since each unit services a specific room, filters in those units can directly affect the quality of air in each room, individually. That means with filters in each of your units in multiple rooms, you’re not just making sure each room is comfortable but that the air quality is better. If certain rooms are no longer being used, you can still make the rooms you use daily more comfortable without worrying about wasting energy heating/cooling an empty room. This makes it great for empty nesters or those aging in place who may not use all of the rooms in their house. Sunrooms, which typically have little wall space to spare, could benefit from a variety of ductless system unit styles, including those that can sit detached from the wall on the floor or even ceiling. Garages and converted garage apartments may sometimes be detached from the house, and that means they aren’t benefitting from any HVAC system you may have running through your home. A ductless system can provide a garage or detached apartment with cool and/or heated air without a messy or costly installation. Rooms that have cold or hot spots can benefit from ductless heating/cooling. The units can be used to better control the temperature to target problem areas without running up your energy bill. All in all, there’s plenty to love about the idea of going ductless. If you decide to, it’s important to hire a professional for the installation as a pro will be able to install the units and ensure the electrical work is handled correctly, and that any access holes are sealed properly. While DIY installation may be possible, the expertise and technical knowledge of a trained professional will be able to guarantee everything is done correctly, and that the system works flawlessly.